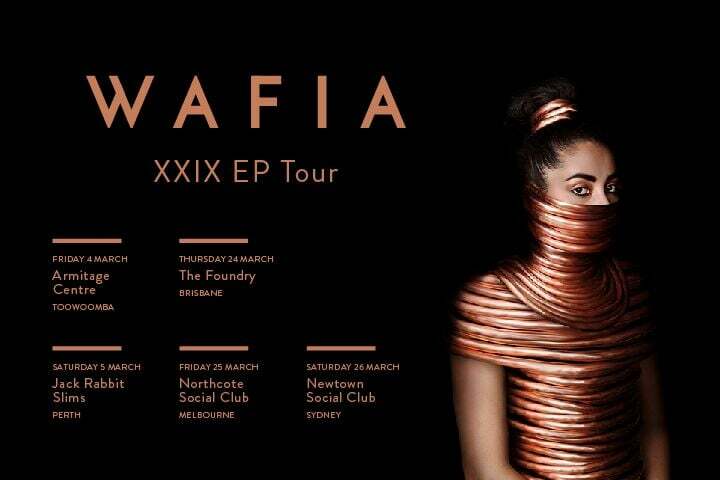 After making considerable buzz with the release of her debut XXIX EP in 2015, which features her impressively smooth single ‘Heartburn’, WAFIA is pleased to announce her national XXIX EP Tour this March - her first headline shows to date. Wafia will be stopping off at the Armitage Centre (Toowoomba), Jack Rabbit Slims (Perth), The Foundry (Brisbane), Northcote Social Club (Melbourne) and the Newtown Social Club (Sydney). The tour follows a stunning run of live summer shows alongside long-time collaborator Ta-ku at Field Day, Beyond The Valley, and LA’s Neuehouse Gallery. The pair also played ‘Heartburn’ together at a special one-off session at the MoMA PS1 in New York. See the video directed by Nic Wrathal shot at New York’s MoMA Gallery here. Wafia also plays alongside Sampa The Great at the sold-out January edition of the FCxMCA Sunday Sessions this weekend. "Wafia is going to be huge." "From the first to last note, even the most novice listeners can tell Wafia puts hefty doses of emotion in her work, and with what cinematic, dimly lit electronic the aforementioned producers offer to her, each track kneads together flawlessly." "As far as debut EP’s go, there are impressive releases, and then there’s Wafia...One thing is for sure though, Wafia is absolutely one to keep an eye on and this EP is concrete proof that she is in a league of her own." "...while she lends her breathy lilt perfectly to collabs, her own tracks are where her talent truly shines. Organic-sounding instrumental layers and a shuffling rhythm create an understated, sentimental atmosphere. Slinky and smooth, the soundscape is dotted with the occasional synth flicker, backing vocal loops and other intricate decorations - the devil truly is in the details." "With production from Ta-ku, Thrupence and Vancouver Sleep Clinic, Wafia's voice shines through each track. It's a stunning debut..."
"It may be the first official long release from Wafia, but with a track history as incredible as hers, it’s only a matter of time before the world knows her name."